One thing I find particularly difficult in my transition to veganism is not being able to eat milk chocolate. My whole life I’ve been a chocolate fiend and absolutely adore the creamy taste of milk chocolate – but actually I don’t have to give that up! With veganism and dairy-free diets becoming more popular, there is a huge range of vegan chocolate available now, and while it might not taste exactly the same as a bar of milk chocolate, that doesn’t mean you won’t find something you like just as much! Vego vegan chocolate is a firm favourite in the office. If you haven’t tried it yet then what are you waiting for?! If you don’t like hazelnuts I wouldn’t recommend it as it is made with the finest Italian hazelnut paste blended with whole hazelnuts – it’s basically Nutella in solid form. Not only is it the most delicious vegan chocolate bar you’ll have ever tasted, it’s also Fairtrade Certified, organic and gluten-free, so you can enjoy it without any guilty feelings! I recently tried Plamil for the first time – just before Christmas actually. I was looking for a vegan advent calendar that wasn’t too expensive so I decided to try one from Plamil and honestly it was delicious, it took all I had not to open it all on the 1st of December! Plamil’s chocolate is completely dairy free so it’s suitable for vegans and vegetarians, instead of using milk or soya, the chocolate is made with rice for a unique yet delicious taste. Plamil also uses organic and Fairtrade certified ingredients where possible as they are committed to protecting people and planet. If you’re love truffles, look no further than Booja Booja’s vegan chocolate truffles – so delicious you wouldn’t even know they were dairy free. 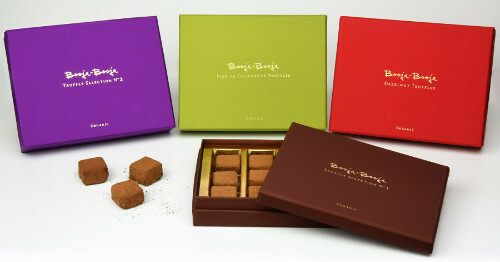 We love Booja Booja because they are a UK based company that uses organic ingredients to make their dairy and gluten free truffles, so no one has to go without and the planet does not suffer. What’s great is that the truffles come in a range of flavours including stem ginger, champagne and hazelnut, and they make great gifts for your vegan friends and family – or anyone who loves truffles! The perfect vegan gift. 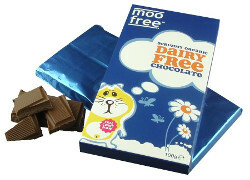 Another vegan chocolate brands that makes a tasty alternative to milk chocolate is Moo Free – the clue is in the name. Moo Free chocolate is made without cow’s milk, instead using rice for that delicious chocolate taste. What’s more, the award winning vegan chocolate bars are made in factories in the UK that do not handle milk, gluten or soya. They come in a range of flavours too including mint and orange. Vivani produce chocolate in wonderful flavours, and have a range of flavoured dark chocolate suitable for vegans that’s just that little bit more exciting than regular dark chocolate. This range includes chilli, cranberry and orange, three delicious tastes and all are made with responsibly sourced cacao and other certified organic ingredients. Vivani chocolate would also make a great gift for a loved one, it comes in gorgeous packaging and tastes divine! Raw chocolate is becoming ever more popular too – it’s a healthier option and is suitable for vegans too. Raw chocolate is made with cacao that has not been oven roasted, and instead is left to dry naturally in the sun thus retaining beneficial nutrients and antioxidants that are lost during the roasting process. Raw chocolate tends not to be mixed with dairy and unnatural sweeteners either, giving you an authentic chocolate taste. Our Raw Chocolate brands include The Raw Chocolate Company, IQ Superfood, Mulu and Ombar. So what’s your favourite vegan chocolate? Have you tried raw chocolate? Let us know your thoughts in the comments below! Next story Stuck for Ethical Valentine’s Day Gifts? We’ve got you covered. Previous story Shaun the Sheep is back!